As I sit down to write, I don’t know exactly what this post is going to do. I don’t have answers. I don’t know how we should respond to this. I don’t know what action we need to take. But I have to write something, even if it is emotional, incoherent, lost. The only thing I can hope for is that what I’m writing mirrors what some of you are feeling and we can feel some sort of recognition in a world that I don’t understand. Less than a week ago, we learnt of the horrifying mass shooting in Orlando, a homophobic attack in a gay club on a Latin Night that claimed the lives of at least 49 people. We saw hatred manifesting itself in the senseless murder of innocent people. The feelings after this are a paradox. An overload of emotions that leaves numbness. The shock and denial, the disbelief, and yet, for so many LGBT people, the recognition, the knowledge we hold with us that there are people who hate us, who would harm us if they could. I have cried more in public in the last week than I probably have in my adult life, with despair and fear and anger. But I have also felt the most profound, overwhelming sense of love for the LGBT people in my life, so diverse and individual, from my closest friends and my family to people I’ve worked with, people who I only knew online but were part of my support network when I was 14, people I’ve met once at a club or LGBT event. I desperately want all of them to be safe. I don’t know how to do that. While many of us were still trying to comprehend the news from the USA, yesterday, Jo Cox, Labour MP for Batley and Spen, was murdered before her constituency surgery. These events are not directly related, but this, too, seems motivated by hate. I have long admired Jo’s work, as an MP and before, with her advocacy on behalf of refugees, her firm belief in gender equality and the humanity with which she approached everything. While there is still much that we do not know about the attack, there is mounting evidence that it will have been an attack on her values – the values that many of us will share and hold to tightly. Many of the articles I have read about Jo have focused on her position as an MP, which is important, but this act of violence terrorises beyond the political. The targeted values are intensely personal as well. For both of these events, I can’t write beyond emotion. I know I should be using this space to urge you to do this or think that or to criticise the media or society at large or my social media feeds. But I can’t do any of that. It’s too early for me to fight. All I can do is affirm how wretched things are and hope that we find a way to make sure this week never repeats itself. In recognition of the lack of direction in this post, I am using this space to share some of the posts about Orlando and Jo Cox that I have seen over the past several days. I don’t know if I support everything in all of them, but I hope that some of you may find something in these that resonates with you and helps you see your way forward. If you have other articles you have found helpful, please post them in the comments. The image by Fibonnaci Blue is used under a creative commons licence. 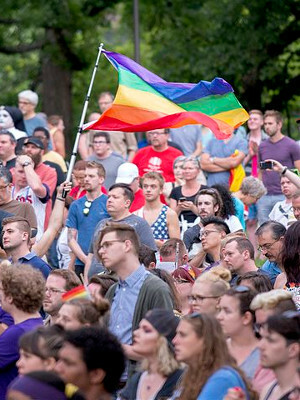 It is a photo taken at a vigil to unite in the wake of the Orlando Pulse shooting in Minneapolis, Minnesota. 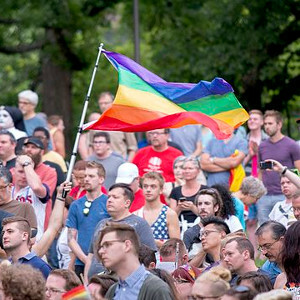 It shows a crowd of people outside, with a rainbow flag held by someone flying in the wind.